For those in (or coming to) Atlanta, I’ll be making appearances at two big events on Labor Day weekend (Sep. 4-7). I’ll be hopping back and forth between DragonCon in downtown Atlanta and the Decatur Book Festival in (you guessed it) Decatur all weekend. Description: How to write for an audience that’s half your age–or less. Tapping into the minds of today’s young people–what DO they want to read? Description: What lies ahead for the S/F, Fantasy and Horror genres? Can we forecast trends or should we just jump on the bandwagon? At the Decatur Book Festival, I’ll be appearing along with author David Lubar at 4:30 pm Saturday on the Target Children’s Stage. Signed copies of the book will also be available the whole weekend at Little Shop of Stories on Decatur Square. And I’ll be wandering both events with no real planning all weekend. Books will be available at the DBF for signing after the appearance, and I’m going to try to have some on hand for random buyers at DragonCon. I hope to see as many current and potential Doc Wilde fans at both events as I can. After promising various folks I’d do so, I have finally gotten around to figuring out how to handle personal inscriptions for folks unable to see me at a public appearance. If you already own a copy of my book, for $1 US I’ll mail you a signed adhesive book plate to put in your copy, inscribed to whom and however you wish it to be inscribed (within reason). If you don’t already own the book, or wish to obtain more copies, for cover price ($15.99) you can order a personally inscribed copy directly from me. Shipping is free (unless you’re outside the US, then I’ll have to check on rates). Again, I’ll sign it to whomever you wish. A note to collectors: the first printing has sold through about 2/3 of the way since the book came out in May. So if you’d like your copy to be a first edition, you may want to get your order in sooner rather than later. Payment can be made by credit or debit card via PayPal (there will be an additional .50-75 charge to cover PayPal fees) or by money order (no checks). I can assume no responsibility for postal failures; if you’d like to insure the delivery, it’s an additional $1.75. To order, contact me through the Contact form on the Doc Wilde site. And, as always, please be patient if I take a few days replying, as I’m doing all this on my own. Bobby McFerrin’s Amazing Musical Mind Control! In an appearance on a panel at the World Science Festival, Bobby McFerrin uses his superpowers to turn a crowd into a huge musical instrument. Fascinating and entertaining. There was a time her door was never closed. Her music box played “Fur Elise” in plinks. Her crib new-bought–I drew her sleeping there. The little drawing sits beside my chair. These days, she ornaments her hands with rings. She’s seventeen. Her door is one I knock. In sunny water, in the kitchen, there. And now this boy buys her silver rings. He goes inside her room and shuts the door. Those days, to rock her was to say a prayer. Of bees and horses, in the pasture, there. But she herself will not be living there. School Library Journal Reviews Doc Wilde! As promised earlier, here is the review School Library Journal gave my book, Doc Wilde and The Frogs of Doom, in their August 1st issue. I edited out a line I thought was a bit too much a spoiler about the plot. The action bounces breathlessly from crisis to crisis, with the Wilde family’s scientific gadgetry and arcane skills in constant demand. The mock heroic dialogue is sometimes a bit exaggerated, but for the most part, everything is played with a straight face. Kids won’t be familiar with the adult-oriented sources, but the book’s small format, breakneck pacing, and broad humor will appeal to middle-grade adventure fans. There are certain reviews that are very important for a book. Publishers’ Weekly, Kirkus Reviews, Library Journal, School Library Journal, and Booklist are biggies because bookstores, libraries, and schools use them to make their decisions about what books to buy for their shelves. Unfortunately, a lot of books are published every year, and those publications can’t cover all of them. I’ve been fortunate not only in the fact that most of them have now reviewed my book Doc Wilde and The Frogs of Doom, but have reviewed it very positively. Written in fast-paced, intelligent prose laced with humor and literary allusions ranging from Dante to Dr. Seuss, the story has all of the fun of old-fashioned pulp adventures. Daring adventure! Dastardly villains! Climactic cliffhangers! Readers seeking these attributes in a book, look no further. Byrd updates the old movie serials genre, populates his story with an adventure-seeking family that brings to mind superhero versions of Steve Irwin and his children, and dusts the whole thing with Indiana Jones–style searches for magical artifacts. Oh, and he adds frogs, lots and lots of frogs. Brian and Wren Wilde are being raised by their widower father, who is not only an adventurer extraordinaire but also designs high-tech gadgets, speaks many languages, understands the nuances of other cultures, and performs martial arts with equal skill. Brian and Wren are pretty good in those areas too. So when their grandfather is captured in the South American jungle by those who worship a frog king intent on swallowing the universe, thus turning it into a black hole, well, something must be done. The premise can get awfully silly even for a book that’s more like a cartoon. But the action never stops and the quick pace will appeal to reluctant readers. Look out! Here comes The Spider, man! If you read this blog regularly (well, as regularly as I post to it anyway, these days), you may have noticed I love old school pulp adventure. Doc Savage, The Shadow, Conan, Fafhrd and the Gray Mouser, Indiana Jones, The Rocketeer, that sort of thing. Anyway. One of my favorite pulp heroes is The Spider. I subscribe to Girasol Collectibles’ quarterly reprints, each of which contains two of the Depression-era Spider novels, most of which were written by Norvell Page under the publisher’s house name of Grant Stockbridge. I also have other paperback Spider reprints, including one of those currently in print from Baen Books. 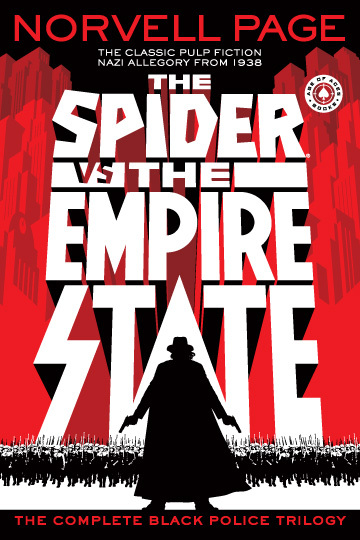 Now, Age of Aces Books has released a volume of three interconnected Spider novels called The Spider Vs. The Empire State: The Complete Black Police Trilogy. My copy arrived from Amazon yesterday, and it’s a gorgeous book, all lurid red and black with the feel of a fascist propaganda poster. (And if Age of Aces or anyone else out there has a copy of this poster they’d be willing to donate to a poor modern pulp author, please let me know).